Tagged under Akira Toriyama, Toei Animation, Series. 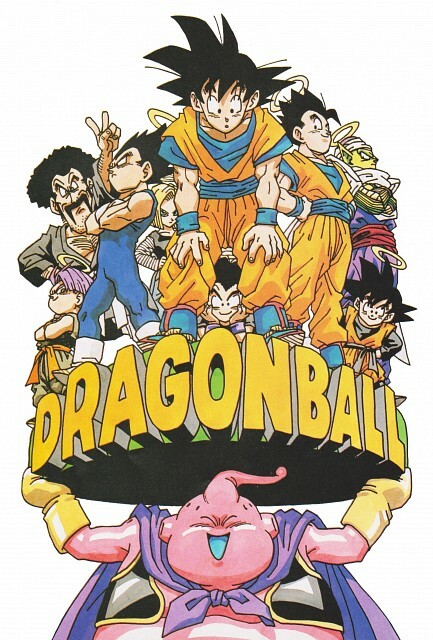 Dragon Ball is a 42 volume manga by Akira Toriyama that ran from 1984 to 1995. The story follows Son Goku in a tale reminiscent of the 16th-century Chinese legend Journey to the West. Beginning with Goku as a child, the story traces his life all the way to him becoming a grandfather. any wish to be granted for the person who can gather all seven. Dragon Ball Z is the second portion of the anime and follows Goku's adult life, later edited and remastered into Dragon Ball Kai. Dragon Ball GT follows Dragon Ball Z and is not based on the manga. Note: The characters' Super Saiyan transformations are listed under their respective character's tag. Since its release, Dragon Ball has become and still remains one of the most successful manga and anime series of all time. So it's no surprise that finally a dedicated adaptation of the manga appears after such a long time. Despite some annoyances, Kai does its best to be considered the best version of this classic shounen franchise. Even if it seems like it is treading unfamiliar grounds in places, cutting of the final Saga, the storytelling and merits provide the lighthearted sense of adventure and great entertainment that make this remade, once in a long time of those long-run shounen anime, such fun. This was my very first anime, I've seen it first when I was 4 and it was a repeated broadcast on one of the kids channels. The beginning of the story is quite enjoyable. The plot is well articulated and many things prevent it from being boring. We not only have battle, but also friendship, trainings, funny moments, and many interesting secondary characters. Dragon Ball Z is focused above all on battles. I really hate the fact that people revive so easily, that every battle lasts for weeks, that the enemies follow each other as in a climax, from the weakest to the strongest and they always target our Earth. This series always follows the same repetitive scheme, and the characters - Goku above all - seem to have no feelings: they only think about training and fighting, they only live for this. Also the fact that the dragon balls can grant any wish diminishes every event: why do you have to be sad about someone's death or the Earth exploding into a thousand pieces? In the end it comes down to nothing, everything returns to normality in two seconds and nothing changes. I didn't like the third season at all: a useless addition. VEGETA: "Goku! I’d rather die than fuse with you!" GOKU: "But, Vegeta… we’re already dead!" since there was a tag merging, going to re-edit. I'm a big time z fan, wasn't a big fan of the original nor GT. I own a bit of the entire series, but own all of z movies and most of z past Trunks saga, didn't care for it much and dbz kai was nice about cutting out wasted trash talk and standing around with power ups or just standing around doing nothing. The first anime I ever saw, thanks to Toonami. (Which I think is probably the case for quite a few.) I also watched all of this series in English; until Dragon Ball Super. The very epitome of shounen. It also has such notoriety that even mangakas still to this day pull inspiration from Dragon Ball. I'm also watching Dragon Ball Super. Grew up on this show. It made me happy and I loved all of the characters. Plot was cute sometimes. I don't remember much about it though. This is definitely one to watch again soon. If anything just for nostalgia. Watched this after having seen Dragon Ball Z (wanted to see the history of the characters, as opposed to hearing references once in a great while in the Z anime). This was much more fascinating and fun to watch. The characters, enemies, and dangers are on a more realistic level. Krillin is able to contribute to the team throughout the whole series. Seeing more of Korin and the Master Roshi was nice too (they actually fight and teach in this). Meh. It was ok. There were some funny parts but DBZ is much better then Dragonball. I think you can actually go straight to DBZ and start watching that then having to start watching Dragonball. But if you would rather start from the beginning I guess you can watch this anime then. I remember, this was one of my first anime! Since I was a child I don't like it so much, maybe beacuse I was too young, and I watched more shoujo anime more :D But it's interesting to see the main character SonGoku how he is growing. And I meant by completely is from the very beginning of Dragon Ball to the end of DB. I watched it years ago, I think it's aired soon after Sailormoon show finished at 9 am. I vividly remember how we used to ran howe after Sunday Mass finished and sat down in front of the old TV, without changing our clothes and started to watch Sailormoon while waiting for Dragon Ball at 9.30 am. My brothers loves it so much that they even saves money to buy the book, and the non-buyer waiting in a queue, fighting over the next turn to read it. I still couldn't finish watching this series, but I own it all in manga and I own the specials in VHS, but they're in my other house so I don't really remember what is from DB and what is from DBZ. I think the adventures of kid Goku were better than the ones he went through in DBZ, it was way less repetitive than those days of endless fighting and training... even if it was really all that he did in both series. Goku as a kid.Yes please! I tell you.The first time I saw this I was astounded.I just love the beginning of every epic story,from the first encounter with the Red Ribbon Army to meeting every bodies favorite porkchop Oolong.Add to that the first Kamehameha ever done by Goku and a Spirit-Bomb just to spice things up and you know this is the beginning of an awesome series. I can with confidence say that there may not be a single person of my age in Poland that haven't watched "Dragon ball" in childhood days. It was airing on public tv so many kids watched it with passion. I was one of them. "Mommy, daddy, hurry up! I can't be late for a new episode of <Dragon Ball>" - that's what I and many of my friends were telling to our parents, when we were walking home from kindergarten and then from school. I enjoyed DB then, but as I am now I don't want to watch it anymore. But I can't say that I havent watched it ^_^. i already have the complete chapter of Dragon BallZ comics. Good series especially if you've watched BDZ and want to see how Goku gets to where he is at the beginning of DBZ. Lots of background so far into how characters from DBZ met and how their relationship developed.